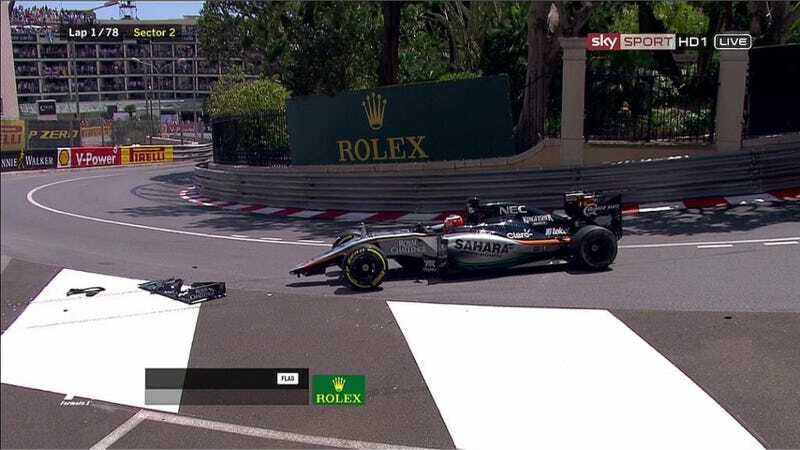 Bad luck for Force India driver Nico Hulkenberg this morning at the Monaco Grand Prix. McLaren’s Fernando Alonso collided with him early on in the race at Mirabeau, forcing him to come in for a new wing and rejoin towards the back of the pack. Talk about a crushing blow for Hulkenberg. Hulk started thirteenth, and after he came in for a new wing, was briefly throwing down some of the fastest laps of the early part of the race. This moved him even further away from those precious, precious points. No! I’m done with you for falling off, wing. Feel my wrath. He’s lucky he didn’t accidentally puncture a tire moving back over the broken wing. “I touch with Hulk, I was on the inside. I think everything is okay,” Fernando Alonso radioed in shortly after the accident. Alonso was handed a five-second penalty for causing the accident, which he served during a pit stop towards the middle of the race. McLaren curiously didn’t elaborate much on why the penalty was necessary until after he came in, when they told him it was from the contact with Hulkenberg.